A couple of years ago, I called the Sports Mall in Murray. “Do you have Pickle-Ball courts?” I asked. “What the hell is Pickle-Ball?” they said as they gave me the bum’s rush. Recently, I called them to ask the same question. They now have two courts and are willing to add a third to accommodate new players. A couple of years ago, I lobbied Salt Lake City’s Parks & Public Lands Division (PPLD) to reclaim the abandoned tennis courts in the Avenues on Fifth Avenue and C Street for Pickle-Ball. “No way,” they said as they gave me the bum’s rush. Last month, Rick Graham, the director of public services, told me that a pair of spiffy Pickle-Ball courts will be built on the site this summer. So it goes. I wouldn’t be surprised to find similar turnabouts in Colorado Springs, Toledo and Ann Arbor, as passion for Pickle-Ball has coursed northward from Sun Belt retirement enclaves in an onrushing wave. According to the Arizona-based USA Pickle-Ball Association, more than 100,000 people are now playing Pickle-Ball in 2,236 locations around the country. In Utah, Salt Lake City has lagged St. George, Draper, Ogden and Brigham City in building outdoor courts, but there are now 27 indoor courts, counting Park City and Kaysville—an increase of 24 in two years’ time. Pickle-Ball is a tennis-like game played with a solid paddle and a perforated plastic ball. The net is two inches lower than a tennis net. Pickle-Ball may not yet be as popular as lacrosse with Millennials, but it is all the rage with Baby Boomers. There are several reasons for the sport’s popularity. It’s more forgiving than tennis—especially on aging knees and slowing reflexes—and is “a sport where shot placement, steadiness, patience and tactics have a far greater importance than brute power,” according to Pickle-Ball, Inc.
Learning the basics takes minutes, not hours, and the game has an infectious appeal. The sport was invented in 1966 by the late Joel Pritchard, a congressman from Washington. He cobbled together handmade plywood paddles, a borrowed Wiffle ball and a badminton court to create a game for his kids. Getting outdoor courts built in Salt Lake City was much harder. Even as Draper, Brigham City and St. George were building Pickle-Ball courts, the PPLD was resistant to the if-you-build-it-they-will-come approach to what they regarded as an upstart sport. Eventually, a vote of support from the Greater Avenues Community Council caused Pickle-Ball lines to be painted on three tennis courts—one each in Pioneer, Reservoir and Sunnyside parks. In 2012, I made a pest of myself by asking repeatedly when Salt Lake City would build its first outdoor Pickle-Ball court. Finally, Art Raymond, a spokesman for the mayor, told me it would be a long, long time. It turns out Raymond was wrong. Within the next two or three months, Pickle-Ball courts will be built in Riverside Park, Jordan Park, Victory Park and on the corner of Fifth Avenue and C Street. Eight courts in all: the same number as Ogden; the same number to be built in Bluffdale’s Southwest Regional Park next year; 16 fewer than at the St. George complex. I credit Graham for the turnaround. But he demurs. He talks about the results of a departmental re-evaluation and a weather eye for evolving community interests. “I am pleased all the right things came together,” including funding from the city council, he says. Graham says that no courts are programmed for 2015, but if the eight new courts get a lot of use, “the next frontier is indoor sites like Liberty Park and Oak Hill.” Meanwhile, a fledgling Utah Pickle-Ball Association is gearing up to provide lessons for beginners, according to its president, Gil Podolsky. 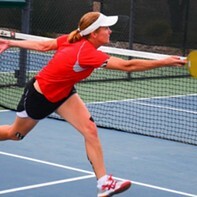 I will use the outdoor courts often, and I will keep trying to find new players. I don’t want the Pickle-Ball groundswell to collapse as inline skating’s did in the 1990s. On the other hand, I understand that when the city invests in Pickle-Ball, there is less money for resurfacing tennis courts and other recreational uses. It is a zero-sum game in which competing niche sports—the likes of rollerblading, bocce, skateboarding, handball and Frisbee golf—lose out. As a Baby Boomer, I suppose I have come to expect that my interests would be privileged, but if I didn’t believe that Pickle-Ball had unique transgenerational appeal—grandparents teaming up with grandchildren—I would feel a little guilty. But not too guilty.